There are occasional track days when some people don't give way to those who clearly deserve to run ahead. The governing bodies try to filter the fast from the slow, but introducing lots of horsepower, conceit, and a narrow track can complicate things further. 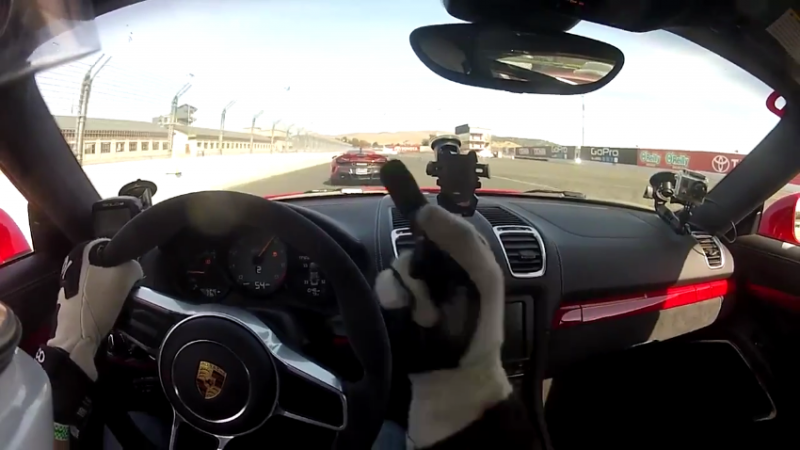 In these cases, a quick lap can easily be ruined by an oblivious driver in a faster car. Such was the case when an owner of a Cayman GT4 decided to try his hand at the daunting Sonoma Raceway, and had his hot lap interrupted by an overly ambitious McLaren owner. The man in the Macca lets two GT3s by as the video begins, but—almost reluctantly—he shuts the door on our camera car heading into Sonoma's fast esses. Passing here is a non-starter, and so our camera man backs off slightly. Understandably, the man in the orange Macca begins to charge, but his hesitation at the exit of the esses suggests he's aware of the red Cayman growing larger in his—admittedly tiny—rear window. After a shortish lift off the throttle, he decides to streak ahead to our camera man's frustration. These gesticulations can be justified when lapping six seconds faster than the hypercar in front. When a chasing car is able to crowd someone's rear-view mirror repeatedly, the man ahead ought to lift briefly, give the appropriate point-by according to the rules, and allow the car behind to pass. Between similar machinery, this usually happens effortlessly. However, the horsepower disparity between these two adds another level of complexity. This squabble could've been avoided if the McLaren's driver had a better sense of spacial awareness when heading towards Turn 11 (0:31). His exit speed wasn't great, the track was at its widest, and he couldn't have been completely oblivious to the Cayman running alongside. But, the 675LT's twin-turbo V8 trumps the incensed camera man's talent advantage and wins the drag race to Turn 11.. Some might advocate a calmer approach, and most coaches would agree. Biding one's time, remaining patient, and waiting for an obvious gap to open are appropriate for an HPDE, which is not a race. However, when there are open passing rules, as one can infer from the on-track behavior here, people want to make the most of their time on track. Hence our camera man's obvious—if not excessive—frustration. After giving a one-finger salute, the 675LT showcases its incredible horsepower advantage and streaks away, yet, the Cayman's driver closes the enormous gap in the space of just two corners. At that point, the man in the British supercar couldn't feign ignorance, and only after the end of a irritating lap, the McLaren's driver relents and opens the door. While it wasn't egregiously bad behavior, it's not a great way to make friends at an HPDE, which is supposed to have a relaxed atmosphere. In situations like these, it's wise to remember: nobody wins practice. Wow thats a lot of cameras in the Porsche, was ESPN filming a special on track day heroes? There’s nothing to win on trackdays. A so-called experienced driver should calm down instead of getting frustrated. Am I seeing a black GT350R crowding the Cayman GT4’s rear view mirror? Apparently, he was lapping six seconds faster without traffic. In these situations it’s often best to make a quick trip thru the pit lane to change your track position and get clear of the problem. No need for single digits! Just stay clam and force a smile on your face! Time to take some anger management classes. The beautiful thing about these responses is that they appear to be from experienced drivers. The “slower” drivers- especially people in faster vehicles who do not have experience are usually out there to get some seat time. Those who have road racing experience usually understand that they will always catch the lesser talented drivers in the corners lap after lap. Frustrating, and part of the HPDE process. Having better clues as to flagging always helps, so attending driver meetings is always a good idea. Some drivers should not be on a track, especially if they don’t have much track time. They should have private practice with pro.drivers and when they can drive and appreciate the other drivers on the track they can go for it. You have it backwards – the whole point of HPDE is to educate novices in car handling and track etiquette while bringing them along incrementally until they become “advanced solo” qualified…if they wish. After track time at that level they are free to go on to bigger and better track events for those aspiring to get noticed by Penske or Ganassi. Short-circuiting the process only leads to greater frustration (this video) and inevitably, accidents. My track experience was straight from the road to the track with Porsche Sports Driving School in Queensland with Chief Instructor Tomas Mezera and his Pro drivers with Cayman, Boxster S and Turbo, GT3, GT3RS and all the models in-between were i learned how to trail brake, look into the next corner, etc. etc. I thought i could drive well before i started attending level 3 or Performance tack days, i know now I can. If you have no high speed track experience with say such as Porsche Sports Driving School Pro. instructors and their cars you should not be on a high speed race track, it sets you up to try to avoid any accidents which will spoil your day. That is how i learned to drive fast and enjoy it. Cheers.